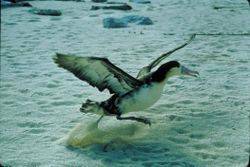 In this page we will look at the amazing Albatross. 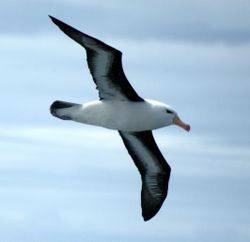 Do albatrosses sleep while flying? According to the Arctic Studies Center, albatrosses are sometimes seen asleep on the water, but this makes them easy targets for killer whales and hunters in kayaks. Apparently, most albatrosses sleep while gliding in the air. However, since recordings required to detect sleep in flight have not been performed, the evidence that they sleep in flight is circumstantial. We know that albatrosses are rarely seen on land, where they gather only to breed. They can’t sleep too long on the water or they will be eaten. Therefore, they would need to sleep while in flight. Scientists also believe that certain sleep patterns may allow birds to visually navigate during sleep in flight. However, this will only be confirmed when we can have recording devices that are small enough to be attached to the bird’s brain. Albatrosses are large seabirds found in the southern oceans and the North Pacific. They are among the largest flying birds, and the Great Albatross has the largest wingspan of any living bird species, with a wingspan of 340 cm (11 ft). Albatrosses are efficient long-distance flyers. Rather than flapping their wings to provide lift as most birds do, they glide on air currents. For every meter they drop while gliding, they can travel forward 22 meters. When their wings are fully extended, they are locked into place by a tendon so that the albatross does not have to expend energy keeping its wings outstretched. An albatross flapping its wings to take off. An albatross’s bill is large and strong, ending in a hook shape. Along the sides of the bill are two “tubes”. These tubes are actually long nostrils that give albatrosses a keen sense of smell, which is unusual among birds. They have webbed feet and relatively strong legs. This enables them to walk quite well on land. Shown below is a video of young albatrosses learning to fly with a little motivation from tiger sharks.